I worked in this mall all through high school at the Original Great American Chocolate Chip Cookie Company. I bought clothes at Stage (a subsidary of Fashion Bar), I ate at Round the Corner and Orange Julius. I bought records and tapes at Musicland. At work I watched the 20-something guys of Aurora buy sweet clothes at Chess Club and the old people dine at Wag’s – located inside the Walgreens. I watched the women of Aurora get free makeovers at Merle Norman and buy wigs made by Barbara Mandrell at the Wig Shoppe next door. I bartered free cookies for free movie tickets and watched Pee Wee’s Big Adventure in the Buckingham Square Mall Theater at least 20 times. This mall had character because it never changed once since 1971. No remodel, no upgrade – it remained exactly the same from the day it opened to the day it closed. It was ugly, outdated, and frankly smelled of desperation when I worked there in the mid-80s, but dammit, it was ours! Not gonna lie…………..shed a tear as I watched the footage of good old Buckingham. Bless her cheesy soul! your story makes me think of the movie Fast Times at Ridgemont High. Did you have to wear one of those lame “candy striper” outfits like in the movie? It was kind of like that…. No stripes, but a lame uniform nonetheless. There is a very high probablity that the Doodles you are standing with is my high school boyfriend Cary as he often filled in as the Chik-Fil-A chicken on weekends at Buckingham. Like “indpendent George”, my two worlds are colliding. Beej – well, that is kind of frightening, now isn’t it? I used to primarily work weekends only, so what are the chances? I don’t remember the circumstances of this beat up old Polaroid, but it was the first picture I found of me in my uniform. I still have my name tag, believe it or not. I have kept some really silly things over the years! Thanks for sharing my pic and video. And thanks for writing about the old mall. Not much is left, just Center Court and north wing. My wife thinks she worked with you (Angela Wilbourn). She claims she also gave you a ride home and you lived way out in BFE. Was “Ron” your boss? I’m sorry to say that I don’t remember your wife (it’s been a looooong time), but tell her thanks for the ride home! My wife looked at your pic and said “yep, that’s her…” BFE to my wife meant anything more than a mile from Alameda. We moved to Aurora somewhere around ’74. I think I was in the 5th grade, the second year Aurora Hills Middle School was open. I spent ALOT of time at buckingham. I remember very clearly when they were building the Aurora Mall as well, and how great Scotto’s seemed. Buckingham was quite the happening place at the time. I went to many movies there, and spent alot of time in the book stores, Red Baron, B & A (the stereo store next to Wards), etc… That period of time when you worked there (and my wife) was years later than when I hung out. I was seriously saddened the last time I went there. But then, it was not as bad as when I learned the the Cooper theater, and Celebrity Sports center were no more. It is probably best that these places are gone, rather than decay into the mess they became. My wife still talks about when one of the Bronco’s (Rubin Carter I think) came and bought 2 Double Doosies, and how big his hands were. Do you remember “Crystal’s” pizza and arcade just north across Mississippi? Definitely a sad time–Buckingham was rapidly becoming the “ghost town mall” when I went to high school (Hinkley ’94), but I have some GREAT memories from there. Playing video games at the arcade, shopping at Wards, Mile High Comics. I had my first sushi at a restaurant there, and met the girl who would be my prom date at the Chik-Fil-A where she was handing out the chicken samples. The fact that the mall was so quiet was one of my favorite things about it. Even at Christmas time the crowds didn’t seem as rude. That is so funny that I worked with your wife! Yes, I do remember Crystals Pizza – we used to go there a lot when I was in middle school. I didn’t know they closed Celebrity Sports Center! (I’ve lived in Chicago for 18 years now…) I used to love that place. Imagine what a cess-pool of germs that place was! But, when you’re 9 and a pool rat – CSC was the place to be since you could swim in the wintertime! Yes, I guess it is better that these things close in the long run, but it still makes me sad. 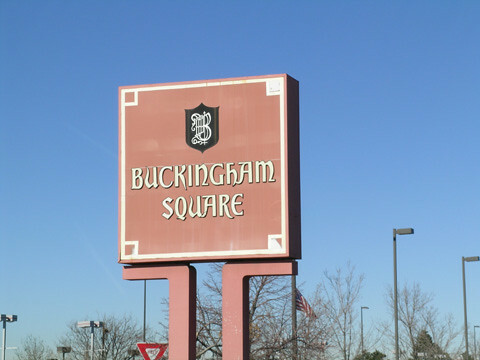 Growing up in Aurora Buckingham Square was my preferred mall to go to because Aurora Mall had too many gang problems. I worked at the Hatch’s Bookstore in the early 90’s. It was on the north end of the mall, next to “Hush Puppies” shoe Store. I can’t remember what that big anchor store was on the north end. When Wards was still there I found a pennant of the Minnesota North Stars (hockey team). They had already moved to Dallas. If you wanted to go over that bridge in the center of the mall you had to deal with those survey people. I also remember that water slide place (Hydrotube?). Because my vision was so bad back then I used to wear my glasses as I went down the tubes. Once I had them folded up in my pocket, and as I went down the water tube, they came out and sunk to the bottom. They had to shut the water down to the tubes and stop everything so we could dive to the bottom and get them. Major embarrassment. We used to go “old people” watching because there were so many senior citizens there because of the proximity of Windsor Gardens. It was only a matter of time before it got torn down.. I think Aurora’s one eccentric mix of old, disheartening locations like the mall that had character and big giant chain stores that are so new that they still have a sheen of plastic to them. It’s now called “The Gardens” or something and just a bunch of free standing retail buildings – and a new Kohl’s which made the news for having 5,000 job seekers in line. Hi! I ran across your site while looking for Buckingham-related news to satisfy a bit of nostalgia. I worked at the GACC from 1991 to 1993. I recognized that cart behind you in the pic immediately 😉 During the time I worked at GACC, the cart was located right next to a smoking area (remember those?) with IPCO Optical on one side and Foot Locker on the other. Good times. I used to say that my friend, Brian and I, ruled that mall in a duel-monarchy. We were the mall-rats during our pre-teen days. The movie theater was the best at $1.50 and my sister had her first job at the Thom McCann shoe store. I was heart broken when I drove by and saw an empty lot. This is what I get for leaving it to the younger generation to take care of. I was a Buckingham Square Mall Rat too. Comics, Sam Short and Frau Schmidtz got me into Art and then Graphic Design. Anyway, here are some pics of Buckingham just before the Demo and After…. This is incredibly sad. I practically grew up in that mall. When I found out it would be demolished, I went back as fast as I possibly could and took pictures. Perhaps I will post them on the Internet. I find “The Gardens” to be quite ugly. Blech, outdoor strip mall. Besides it’s going to be just as outdated in 36 years as good ol’ Buckingham was when it was demolished. I had my first date at Buckingham. Ate at Wags and spent so much time at Zeezo’s Magic Shop and Mile Hi Comics. The “animated” holiday displays always did hold a special place for me even as I grew up and older. I was in shock when I had seen it torn down. Only been by the new development once or twice. Makes me feel old. I lived in Aurora from about 83-87 and after moving back to Pennsylvania at 8 yrs old I would often have these strange memories or dreams of that waterslide! I can remember asking my mom if it was just something I dreamed or if the mall really had a waterslide! I think my dad worked there at a car dealership (?) and I can remember going there in the evenings during the holidays to bring him dinner. If anyone has an old picture of the mall with the waterslide still intact I would love to see it!! I left out the important part. Met my wife at Buckingham Sq 4 and we are still married. She was very sad to see the place that we meet tore down. fun to look in at some of the history of the mall. Can any one remember the name of the sore before it was Dillards? It was a JC Penny and I believe a Joslins before that. Heck yes!!!! Bronco burger, Joyce’s subs…and that store by the main bridge that sold women’s 80s workout gear, and all the women that worked there wore the outfits…what could possibly be more magical than that to a 12 yr old boy. Posted	 March 25, 2013 at 1:52 pm by Melanie H.
Wow, reading all these comments make me feel soooo nostalgic! I remember when BS first opened, my mom would take me to Bronco Burger-they had seats shaped like saddles! Had my first date at the theater. I spent years hanging out at that mall, even after Aurora Mall opened-AM just never had the same character that BS had. Worked at Pet City in the 80’s. I moved away from Colorado in ’94, so I didn’t know until recently that this old place was torn down. So sad, such a wonderful piece of Aurora history. My typical Saturday began with accompanying my grandma on her drive from Windsor Gardens to Buckingham Square, where she would get her hair done at the “beauty parlor.” After she sat under an old-timey drier that looked liked an astronaut’s helmet, we’d go to lunch at either Round the Corner or, more commonly, Furr’s Cafeteria. I wasn’t much of a fan of Jello with soggy fruit suspended in it, but I did love their baked mac and cheese. If I was lucky, she’d give me a dollar to spend at Nickelodeon. I wasn’t quite old or sophisticated enough to shop at Chess King, but I do remember its smell. I’ll take a wild guess and say that it was a delightful combination of polyester, Drakkar, and Jheri Curl. I know it’s a little off topic, but I just remembered Cinderella City too! If Buckingham Square smelled of desperation and failure, Cinderella City added the stench of “basement” to the mix. Cinder Alley? What other mall has shops in the friggin’ basement! Loved going to Buckingham Mall in the late seventies. Must have seen a hundred movies there. Thinking back on how I got here…I was on reddit and came across a post about some abandoned mall in Ohio and was looking at the pictures. This spurred the search “Buckingham Square Aurora” and after the deadmalls.com post (which is pretty detailed, BTW), I saw your post. I’m thinking that pretty much everybody who’s posted here arrived by some similar route, and I love it. I lived in Aurora for 18 years and knew the whole area well. Growing up there, I always thought that the Crystal Palace was a real castle that had always been there before everything else. I grew up in Dam East and I remember going to the mall with my family back in the day…My ma always pined for a dinner at The Broker, but a place like King’s Fork on Colfax was more our speed and/or budget. I now live in Chicago too for the past 18 years after college. I still wonder how people here think that Chick-Fil-A is something for which you would camp out overnight, considering I first ever saw it at Buckingham. It’d be like camping out for an Orange Julius or Sbarro. I’d hazard a guess that you and I are fellow Trailblazers from 92. The world is indeed a small place. Funny how this blog just keeps on growing. Buckingham was THE PLACE to go with my mom (RIP) for an ‘order from the table Round the Corner’ burger. I lived on East Amherst Court in the Dam West, and you could actually walk to the mall from my house in about 30 minutes–heaven for a 12 year old. You won’t believe this: I saw a film called Death Race 2000 at the theatre: starring a very young Sylvester Stallone. We threw popcorn at the screen because it was so bad. God what a great mall. Feels like a home which has been lost to time…. I’ll add a little history here. I moved to Aurora in 1983 at the age of 22. My only job for the four years I lived there was for Mr. Watch where I learned to repair watches. I lived right across the road in an apartment complex and walked to and from work daily. We were right across the way from Zeezo’s Magic shop. I grew up in that experience and I am so thankful to everyone for posting and commenting. I loved Hatches book store for their great magazine section and loved TicoTaco when they moved in. Of course, who could forget Round the Corner restaurant. Alas, all good things come to an end but for me, that period of my life was the best.